With continuous nicotine release. Smokers of 10 or more a day. 24 hour stop smoking aid.NiQuitin Clear Patch relieves and/or prevents cravings and nicotine withdrawal symptoms. It is part of a programme designed to support your wish to stop smoking. The programme contains 3 steps which you will need to follow, starting with Step 1, then Step 2, then Step 3. 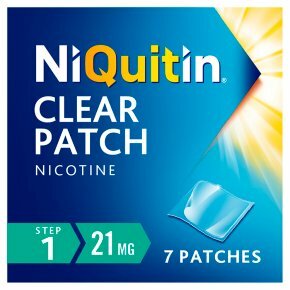 Each Step has its own strength of NiQuitin Clear Patch; the patches are designed to supply your body with the correct amount of nicotine, which decreases as you go from Step 1 to Step 3. Stopping smoking straightaway is best for your health. However if you are not able to, you can also use NiQuitin Clear Patch to help you cut down on smoking, perhaps before stopping, or to help you stop smoking for short periods of time. Please read the enclosed leaflet carefully before using this product You are more likely to quit smoking when using this product with help from a healthcare professional or support programme. How to Use Apply one patch to the skin once a day, preferably on waking. NiQuitin Clear Patch is intended to be used for 24 hours but can be removed before bed (after 16 hours) if preferred. Full instructions are given in the enclosed leaflet. Step 1 (21 mg): Initial treatment period, 6 weeks Step 2 (14 mg): Step down treatment period, 2 weeks* Step 3 (7 mg): Step down treatment period, 2 weeks * Light smokers (less than 10 cigarettes a day) should start with Step 2 (14 mg) for 6 weeks and then Step 3 (7 mg) for 2 weeks. For full instructions please read the enclosed leaflet carefully. For application to the skin. Keep out of the sight and reach of children.<br><br>CONSULT A HEALTHCARE PROFESSIONAL<br>If you have or recently had heart problems.<br>If you have serious liver or kidney disease, uncontrolled overactive thyroid gland or phaeochromocytoma.<br>Before use if you are pregnant or breast-feeding.<br>If you get a persistent skin reaction, remove the patch and tell your doctor.<br><br>DO NOT USE<br>If you are allergic to any of the ingredients listed in the leaflet.<br>If you are a non-smoker, an occasional smoker or under 12 years old.<br><br>DISPOSAL PRECAUTIONS<br>Dispose of patch carefully then wash hands with water only, as instructed in the leaflet.